"Whether their skin be dark or white, all human persons are equal; one may be superior in knowledge, in wealth, in beauty, but not in being more human." - Emilio Jacinto, Kartilya ng Katipunan. Emilio Jacinto was an eloquent and brave young man, known as both the soul and the brain of the Katipunan, Andres Bonifacio's revolutionary organization. In his short life, Jacinto helped to lead the fight for Filipino independence from Spain. He laid out principles for the new government envisioned by Bonifacio; in the end, however, neither man would survive to see the Spanish overthrown. Not much is known about Emilio Jacinto's early life. We do know that he was born in Manila on December 15, 1875, the son of a prominent merchant. Emilio received a good education, and was fluent in both Tagalog and Spanish. He went to the San Juan de Letran College briefly. Deciding to study law, he transferred to the University of Santo Tomas, where a future president of the Philippines, Manuel Quezon, was among his classmates. Jacinto was just 19 years old when news arrived that the Spanish had arrested his hero, Jose Rizal. 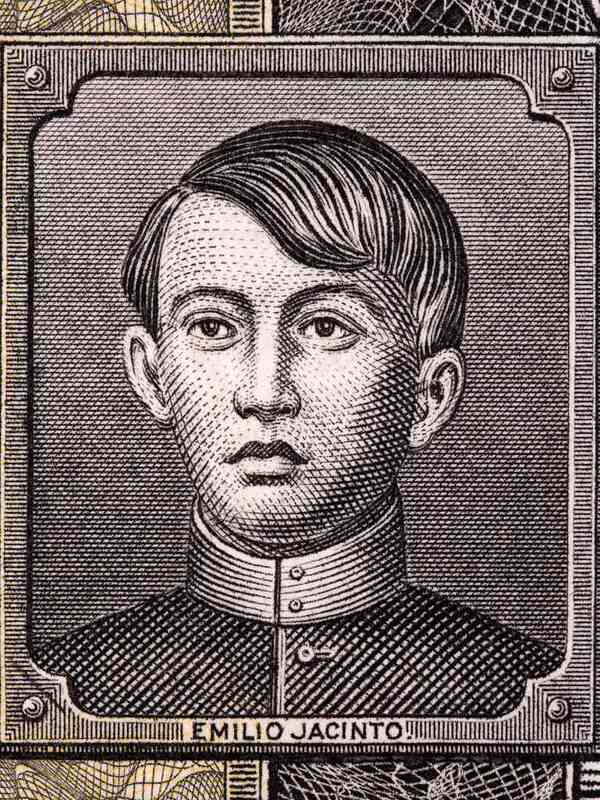 Galvanized, the young man left school and joined with Andres Bonifacio and others to form the Katipunan, or "Highest and Most Respected Society of the Children of the Country." When the Spanish executed Rizal on trumped-up charges in December of 1896, the Katipunan rallied its followers to war. Emilio Jacinto served as the spokesperson for the Katipunan, as well as handling its finances. Andres Bonifacio was not well-educated, so he deferred to his younger comrade on such matters. Jacinto wrote for the official Katipunan newspaper, the Kalayaan. He also penned the official handbook of the movement, called the Kartilya ng Katipunan. Despite his young age of just 21, Jacinto became a general in the group's guerrilla army, taking an active role in the fight against the Spanish near Manila. Unfortunately, Jacinto's friend and sponsor, Andres Bonifacio, had gotten into a heated rivalry with a Katipunan leader from a wealthy family called Emilio Aguinaldo. Aguinaldo, who led the Magdalo faction of Katipunan, rigged an election to have himself named president of the revolutionary government. He then had Bonifacio arrested for treason. Aguinaldo ordered the May 10, 1897 execution of Bonifacio and his brother. The self-proclaimed president then approached Emilio Jacinto, trying to recruit him to his branch of the organization, but Jacinto refused. Emilio Jacinto lived and fought the Spanish in Magdalena, Laguna. He was seriously injured in a battle at the Maimpis River in February of 1898, but found refuge in the Santa Maria Magdalena Parish Church, which now boasts a marker noting the event. Although he survived this wound, the young revolutionary would not live for much longer. He died on April 16, 1898, of malaria. General Emilio Jacinto was just 23 years old. His life was marked with tragedy and loss, but Emilio Jacinto's enlightened ideas helped to shape the Philippine Revolution. His eloquent words and humanist touch served as a counter-balance to the blunt ruthlessness of revolutionaries such as Emilio Aguinaldo, who would go on to become the first president of the new Republic of the Philippines. As Jacinto himself put it in the Kartilya, "The worth of a person is not in being a king, not in the shape of his nose or the whiteness of his face, nor in being a priest, representative of God, nor in the loftiness of the position he holds on this earth. That person is pure and truly noble, even though he was born in the forest and knows no language but his own, who is possessed of good character, is true to his word, has dignity and honor, who does not oppress others nor help their oppressors, who knows how to feel for and care for his native land." What Was the Hukbalahap Rebellion in the Philippines?